Bassett Street Brunch Club is conveniently located on 444 W. Johnson Street. It is one of the most popular spots in downtown Madison for people, especially college students on campus, to grab yummy food. You will find all day brunch and additional delicious comfort food classics on their menu. There will generally be a long wait due to its popularity. Unfortunately, they don’t take reservations before hand, so you would have to go to the restaurant in person to put your name down. I would recommend to call in and check the wait time before you go. But you can certainly grab a drink and enjoy seating outside while waiting. 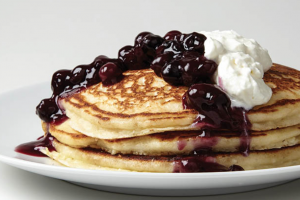 The Blueberry Buttermilk Pancakes is one of my personal favorites. The pancakes are very fluffy yet not greasy at all. The dish is well presented and served with Syrups and butter on the side. You can certainly ask for some whipped cream too. Amazing! Not only do they offer traditional glazed and chocolate donuts but also serve creative flavored ones. I once tried a bacon covered maple glazed donut. It was delicious. 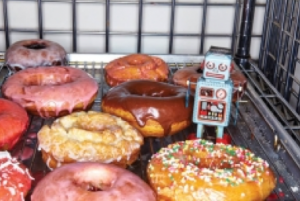 All of their donuts are freshly baked everyday. If you are just craving for a yummy donut on your way to class in the morning, you can always take one to go. The brunch club offers colectivo coffee, which is strong and tasty. And it cost just about the same as the coffee at Starbucks. Overall, I enjoyed my brunch at the Brunch Club. It’s very clean and homie. And most importantly, it offers variety of amazing food and drinks! I would recommend this spot to my family and friends!